Twitter, like Facebook, is a part of the establishment. When Steve Goddard & Tom Nelson's climate questions got too hot under the collar they were suspended. Goddard's account was reinstated after an outcry. But Goddard's suspension lasted only about twelve hours from my observation; Tom Nelson's (@tan123) has been suspended for 2 days now. Tom Nelson's Twitter account epitomises the virtues of free speech, asking lots of questions that were uncomfortable to the climate establishment. Was Gavin Schmidt (@ClimateOfGavin) the person responsible for getting Tom Nelson suspended? Schmidt blocked me a few months ago. 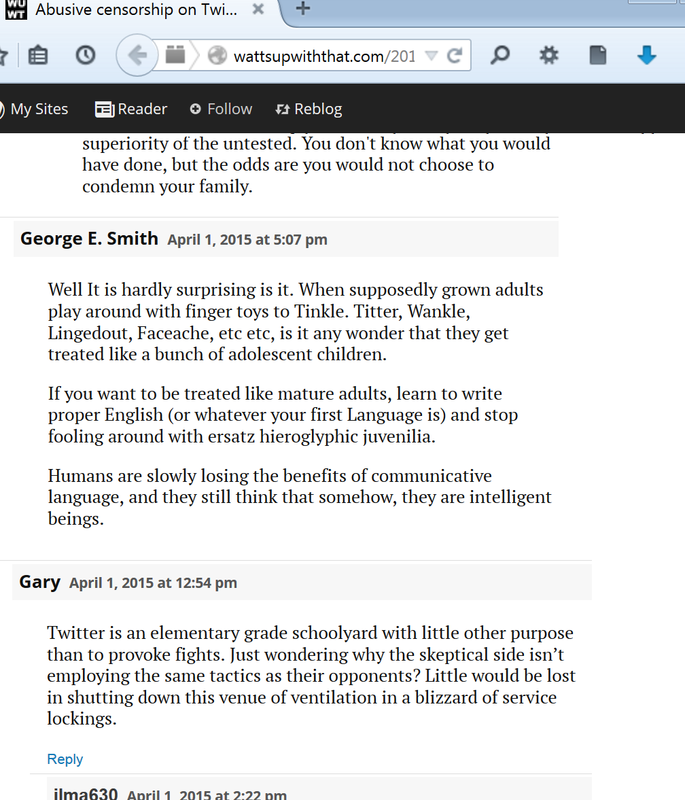 NASA's Gavin Schmidt comes across as a spiteful kinda' guy who will lash out if threatened. And he couldn't care less about, and is mysteriously blase about the causes of, Tom Nelson's suspension. There were some disparaging comments about the Twitter platform in the initial WattsUpWithThat article about the Tom Nelson suspension. I disagree. I think Twitter is pretty good. I discovered Twitter a year and a half ago and have been an avid follower of Tom Nelson most of that time. I find Twitter to be a useful research and communication tool. Sure Twitter is limited to 140 characters, but the fact you can include pics and links compensates for that. I don't even have to surf my usual internet places for climate news -- I can get all my links from Twitter. And Twitter is also good as a debating and communication tool -- as a free speech forum. This aspect is greatly damaged through rash, authoritarian actions like suspending Tom Nelson's account. I thought of quitting Twitter altogether when @SteveSGoddard was blocked a few days ago. My enthusiasm to use Twitter is dampened by this episode too. 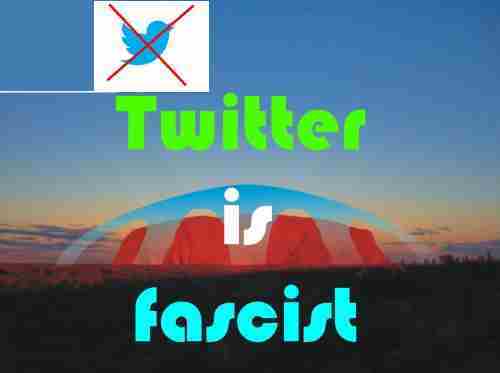 Fascist platforms are no fun. Is there a Twitter alternative? ..and consider reducing my Twitter participation. Update 2/5/15: Tom's account was eventually restored a couple days after suspension, shortly after this post. ● Watts Up With That?